Motorola tells all about its circular smartwatch at its Chicago launch event. 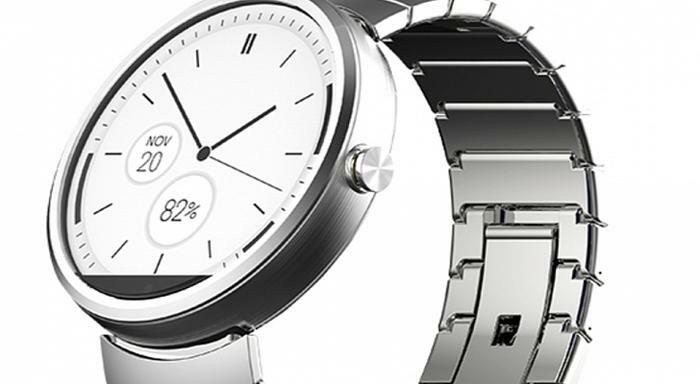 Motorola originally unveiled its Moto 360 smartwatch at Google’s I/O conference. The smartwatch, which at the time was alone in sporting a circular LCD watchface, was met with riotous applause. Rival LG has since unveiled a rounded smartwatch of its own called the G Watch R. The two smartwatches will go head-to-head upon being released. Finer bezels has allowed Motorola to feature a larger LCD screen while preserving comfort. The Moto 360’s screen spans 1.5 inches and has a 320x290 resolution. The formally dressed smartwatch surprises with its rough credentials. An IP67 rating ensures it can take on freshwater one metre deep for thirty minutes. There’s an onboard pedometer and an optical heart rate sensor in addition. Inside the 11mm watchface is a Texas Instruments OMPA 3 processor, 512MB of RAM and 4GB of internal storage. The smartwatch runs Android Wear and will pair with smartphones running Android 4.3 Jelly Bean and above. Charging the Motorola 360 will be done wirelessly by placing it on an included dock. Motorola estimates its 320 milliamp-hour battery will last for a day with “mixed use”. Motorola confirmed to <i>Good Gear Guide</i> the Moto 360 will be released in Australia ahead of Christmas, however the company hasn't shared pricing details. A successor to Motorola's most popular smartphone ever, the Moto G, and Motorola's new flagship Moto X, were also unveiled at the Chicago-based event.